20mM Tris, 150mM NaCl, pH8.0, containing 1mM EDTA, 1mM DTT, 0.01% SKL, 5% Trehalose and Proclin300. 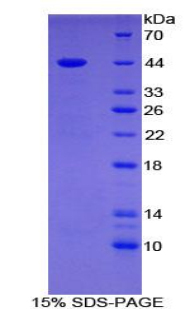 Small volumes of GT recombinant protein vial(s) may occasionally become entrapped in the seal of the product vial during shipment and storage. If necessary, briefly centrifuge the vial on a tabletop centrifuge to dislodge any liquid in the container`s cap. Certain products may require to ship with dry ice and additional dry ice fee may apply. NCBI/Uniprot data below describe general gene information for GT. It may not necessarily be applicable to this product. gastrin: Gastrin stimulates the stomach mucosa to produce and secrete hydrochloric acid and the pancreas to secrete its digestive enzymes. It also stimulates smooth muscle contraction and increases blood circulation and water secretion in the stomach and intestine. Belongs to the gastrin/cholecystokinin family. 1. A novel signal pathway involved in gastrin-stimulated AE2 expression mediated by EGR1 in gastric cancer cells.